Find some unique squishy soaps at Konnyaku Shabon Asakusa Branch! With a variety of color and fragrances, such as cherry blossom, the soaps made out of konnyaku jelly are really unique and great as souvenirs! Asakusa is known to be the tourist hotspot in Tokyo. Many visitors from all over visit this very location to experience traditional Japanese culture. Take a step into the back alley of the busy shopping streets of Nakamise dori, and you will find a slightly different shop. Konnyaku Shabon Asakusa Branch is a shop that carries a new type of soft facial soaps. We would like to introduce some unique and high-quality cosmetics you can find at Konnyaku Shabon. Squishy Soaps That Aren't Hard? At the shop front of Konnyaku Shabon, you will find a colorful display of round objects. You may also catch some tourists taking photos and poking these strange looking objects. However, many people would not imagine these objects to be actually soap. 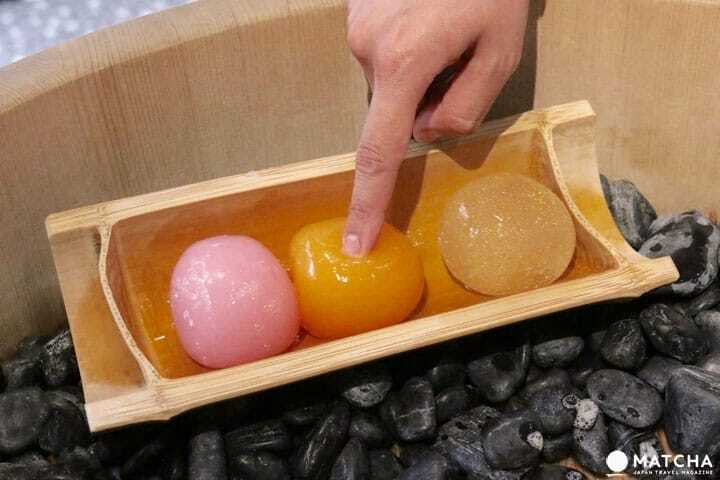 When touching the soaps of Konnyaku Shabon, most people are shocked at how soft they are. They have a squishy sort of feel to them, unlike the standard bar soaps most people are familiar with. These are facial soaps and they use jelly made from the edible konjac (konnyaku in Japanese) plant, which makes this squishy texture possible. It feels very nice, so it makes you want to hold onto it for a while. The facial soaps at Konnyaku Shabon are all round and colorful. Each color uses different ingredients and has a variety of scents and effects. Cherry blossom on the left, ginko in the middle, gold on the right. The most popular is the pink "cherry blossom" soap that uses cherry blossom extract. You can really smell the gentle fragrance of the blossoms. When you use it with water, it starts to foam and adapts to your skin. After using the konjac soap, your skin feels refreshed and you can feel the difference before and after using it. Aside from cherry blossom, there are many types of fragrances depending on the shop you visit. In Asakusa you can purchase ginko, ground cherry, charcoal and even a soap with gold flakes in it. There is a washing space in front of the shop, so it would be great opportunity to try them out first. At Konnyaku Shabon, there are other beauty products aside from soaps. This body soap is one of their most popular products. The jelly-like liquid soap has a thick consistency and foams very well. There are also many types of fragrances for this as well. We also found some bath balls. They have the same jelly consistency as the soap and you are supposed to take them in the bathtub with you while you are taking a bath. They are even reusable. How about trying some other products aside from the soaps? At Konnyaku Shabon, all of their products are made from organic ingredients. Plant-based ingredients rather than artificial coloring or chemical products are used to color or scent. Therefore, even those with sensitive skin are able to use their products without worrying. It is a great feeling, knowing that these items are safe for sensitive skin and eco-friendly. All the soaps of Konnyaku Shabon are handmade. The charm and quality of these soaps come from the time put into each product. The gentle, foamy bubbles that form from the soap prove how high the quality of this product is. The packaging comes in furoshiki (*1) type and bamboo type. Both of them are very Japanese and quite fancy. You can choose which type of packaging you prefer when you make your purchase. *1 Furoshiki: A fabric used to store or carry products. When you purchase a product, you will receive a manual on how to use the soaps and what kind of soaps there are. There are copies in English and simplified Chinese, so it will come handy for non-Japanese customers as well. Konnyaku Shabon has other branches in Japan: at Tokyo Station, and in Kamakura, Yokohama, Kobe and other popular tourist locations. Each shop carries different colors and types of Konjac soaps, with a total of 48 kinds. You will be able to encounter a different discovery every time you stop by other shops. If you would like to experience a new sort of soap, by all means, please visit one of Konnyaku Shabon's amazing shops. Access 6 minute walk from exit A5 on the Asakusa Line. 3 minute walk from exit 1 on the Ginza Line. 3 minute walk from the main exit on the Tōbu SKYTREE Line. Price Around 1,250 - 2,000 yen. Souvenir shopping is a lot of fun!